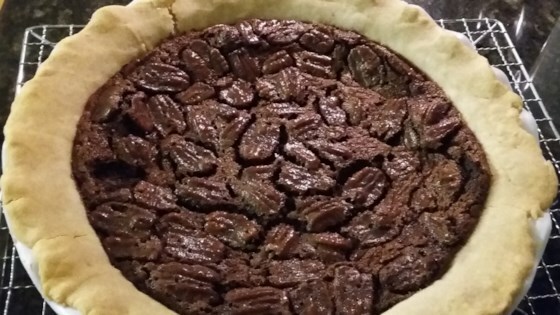 "This is a variation of a pecan pie that blends chocolate chips and bourbon to make a rich and very tasty pie. Serve with a dollop of whipped cream." Press pie crust into a 9-inch pie plate. Prick the bottom of the crust with a fork. Bake pie crust in the preheated oven until it looks dry, 4 to 5 minutes. Let cool. Reduce oven temperature to 350 degrees F (175 degrees C). Pour bourbon whiskey into a small pot; heat over very low heat. Stir in instant coffee until dissolved. Stir in pecans. Beat sugar and eggs together in a bowl until well blended. Beat in corn syrup, melted butter, and vanilla extract. Fold in pecan mixture and chocolate chips. Pour mixture into the pie crust. Bake in the preheated oven until filling is firm and golden brown and crust is lightly browned, 40 to 45 minutes. Cool completely before slicing, at least 30 minutes. Pecan pie with the perfect ratio of nutty crunch to sticky sweetness. Delicious! I subbed coconut oil for the butter, and it worked great!